A Life without Anorexia: Comparing eating - how much to eat? Hey Izzy, sometimes i get a feeling like i'm not supposed to eat so much as you can, because i don't have CF. I mean, of course i dont need to eat so much like you do, but i got a feeling like i shouldnt eat for example a lot of nuts because i dont have CF. But i really love nuts.. I know your disease shouldnt be something to be wanted, but i always get a feeling like: you musn't eat so much like Izzy because you don't need to! I am not binging, i just like to eat a lot. And of course i also think i shouldnt eat so much because i do only cardio and i dont do strenght training like you. I thought i would answer your comment/give my advice in a post incase others feel the same way. First off my "what i eat in a day" posts or when i post food isnt me saying "eat like this/eat like me", its just showing how a day of eating is for me.... listening to my body, eating intuitively. When you have an eating disorder it can feel impossible to eat intuitively, to not count calories, not obsessively count macros or plan every meal... so when i post food diaries its just showing how a day of eating can be when you dont count calories. I.e that somedays i eat 4 meals, somdays 8 meals, somedays i eat 6 cheesesandwiches and other days i eat 10 pieces of fruit. My way of eating and how much i eat is what is healthy for ME. Everyone needs different amounts and feels best eating different ways. You should not compare your way of eating to anyone else because everyone needs different. Of course lifestyle, physical health, activity levels and genes all play a role in how much and what a person needs to eat. For example many ask me if they can see my meal plans from when i was in recovery and i say no because the meal plan was personally made for me and my recovery it was not a "one meal plan for everyone". I.e that i continuously increased calories until i was eating around 3500kcal a day to gain weight and that was what was best for me. My best advice is to try to focus on what YOUR body needs. If you find yourself comparing food intake to others then try not to look at other peoples food or if you follow food accounts or if you get triggered by my food then unfollow - or let me know, maybe i can write food triggers so that you can skip the post that include food? Focus on what is best for your body. Somedays maybe you eat more nuts and other days maybe you eat more oatmeal or more fruit. Think about balance that is the most important, somedays you might end up finishing a whole bag of nuts... its not the end of the world as long as its not a daily thing its fine! Also dont justfiy your eating with exercise. I.e i cant eat because i didnt workout, or i cant eat so much because i only did a short run etc You can always eat whether you exercise or not. Eat TO exercise, not exercise to eat!! Focus on you and what is best for you :) My food pictures should mostly be inspiration and to make others want to eat more than just one potatoe or to realise that its ok to eat both dinner and dessert. Its not a "eat like me" guide, hahah. But also everyone is in different need of calories, i do need a hihgh calorie intake and i am very open about that and i am aware that people need different amounts of calories. I.e some people gain weight on 2500kcal others on 3500kcal, and its just to accept it i guess. Also remember that you can never know what a person eats just from what they share online, i.e somedays i eat lots somedays i eat less but its nothing i share online as it isnt important its just intuitive eating!!! 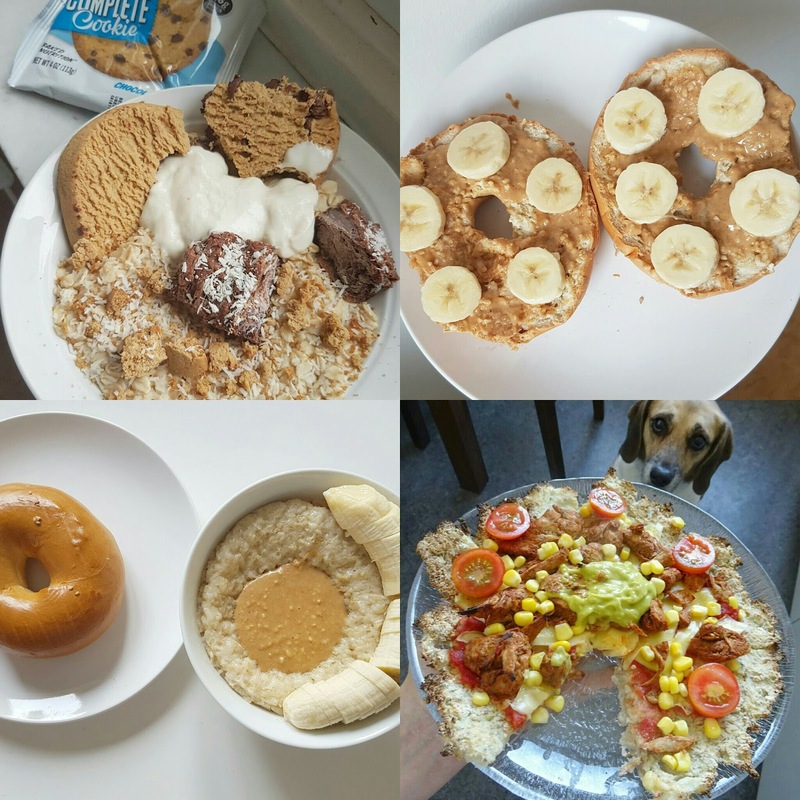 I always find your food posts helpful mainly because of the variety of foods you eat and your different combinations - they give me ideas to try new things myself and combinations I had never thought of. For example, I love it when you post you have had roasted veg as some of the veg you roast I had never thought of roasting until I saw it on your blog, so I have you to thank for that inspiration! Also it gives me an idea of what normal portion size is like when you get to eat intuitively, instead of the weights and measures of a meal plan. And also reminds me that it is ok and normal to have fancies for certain foods one day - that your tastes are allowed to change and no food is off limits!